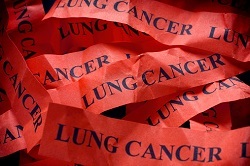 A team of scientists from the University of Exeter has developed a new technique that could create a highly sensitive graphene biosensor with the capability to detect molecules of the most common lung cancer biomarkers. This could be the key to unlocking the next generation of advanced, early-stage lung cancer diagnosis. "We believe that with further development of our devices, a cheap, reusable and accurate breath test for early-stage detection of lung cancer can become a reality."